In PowerApps, we are continuously working on making it easier for you to build business applications without the need to write any code. However, in some cases there may be a need for you to use custom code or APIs created by developers in your organization in PowerApps, or you may want to create custom logic yourself to do some complex processing outside of the standard PowerApps functionality. In these cases, Azure App Service and Azure Functions are commonly used for building customizations that are needed. Today, we are introducing functionality that will make it convenient and easy for you to use Azure App Service and Azure Functions in PowerApps. 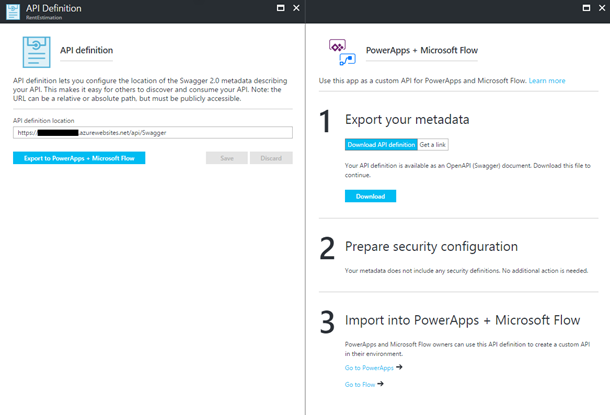 We have made it easy for you to retrieve the API definition for your App Service API or Azure Functions to use in PowerApps, using the “Export to PowerApps and Microsoft Flow” gesture available in the API Definition feature. With that, you will have the option to either get a link to the Swagger API definition or download the Swagger API definition file. See Exporting an Azure hosted API to PowerApps to learn more. 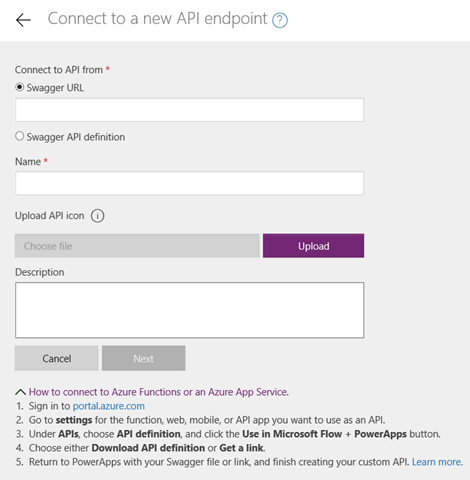 In addition to allowing custom API creation using a Swagger API definition file, we are now introducing a new feature in PowerApps to enable creation of custom APIs using a URL to the Swagger API definition. See Register custom APIs in PowerApps to learn more. Once the custom API is registered, you can use it in PowerApps just like you would any other connection. We are committed to making the experience of consuming Azure and other APIs in PowerApps richer and more seamless in the coming months. So, stay tuned! Please do reach out to us with any feedback about this new functionality via the PowerApps community site. We would love to hear from you!